The United States Chess Federation - Jorge is Back! 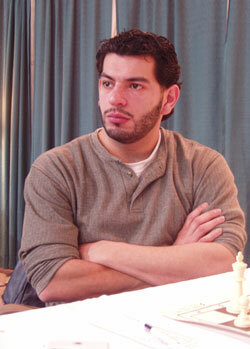 Home Page Chess Life Online 2007 March Jorge is Back! I met Jorge Sammour-Hasbun (he then went by Zamora) in 1995 Guarapuava, Brazil for the World U16 and U18 championships. Jorge had a reputation for being a razor-sharp tactician and for having an exuberant personality. In those days, everyone knew about Jorge's blitz prowess. All you had to do was enter the New York Open skittles room at any hour between 11 PM and 6 AM, and you'd see him battling Kiril Georgiev or Loek Van Wely at three minute chess, for $20 a game. "It wasn't about the money...we usually broke about even. It was about ego." Those marathon sessions were in Jorge's head last Saturday during his match against Kiril in the quarter-finals of the prestigious Dos Hermanas ICC blitz knockout event. Jorge thought his second round game against Georgiev was his best game of the tournament. (Jorge defeated four other GMs on his way to the title!) His game against Georgiev was particularly meaningful because a few minutes before the round, Jorge got a phone call informing him that his close friend from Rhode Island, 25-year-old expert Max Malyuta died suddenly from viral meningitis. Jorge said, "I wanted to win the game, and the tournament for Max." In the other bracket, GMs Hikaru Nakamura (Smallville on ICC) and Tigran L. Petrosian (Anyuta) were battling for a spot in the finals. Unfortunately for American fans, Nakamura forfeited the first game due to confusion about start time. Hikaru went 2-2 in the remaining games and was knocked out, pairing Tigran L. Petrosian and Jorge Zamora in the final match. Jorge's attacking style flourished in his second game against Tigran. In a dramatic finish, Sammour-Hasbun defended a tough endgame for 200+ moves to claim the 2007 Dos Hermanas title and the 1800 Euro first prize over 23 GMs and eight IMs. That Jorge won the event was a shock to fans. Even Jorge's qualification into the tournament was surprising. Because of his long absence from the game and the ease of cheating with computers, ICC administrators insisted that Jorge play the entire tournament under supervision. Jorge's first instinct was to be insulted by this, as none of the other players were required to play with an arbiter present. But when the tournament director arrived at his house, his pleasant and professional demeanor relaxed Jorge. "Now I realize that it was a great thing that ICC did,and I don't take it personally" Jorge says, "Otherwise it would be awkward... if I lose, I lose, if I win, I'm a cheater!" Even fans found it hard to believe that an out of practice, untitled player could prevail over the likes of Hikaru Nakamura and Gata Kamsky. But Jorge is no ordinary untitled player. In his day, he won the U10 and U12 World Youth competitions and defeated the Polgar sisters and Shirov in blitz matches. His talent even attracted the attention of Mikhail Tal, who gave him lessons. Jorge remembers his days of playing chess as a youth fondly. "It feels like it was just a few days ago that we were all in Brazil." Jorge quit chess shortly after Brazil. For the usual reasons. He went into construction to earn a good, steady paycheck and soon after started a family. He now lives in Fort River, Massachusetts with his wife Elizabeth and two children Damion and Laila. When he thinks of his 12-year absence from chess, he wavers from admitting regrets to insisting the break was inevitable. "Chess was like my lover, my woman. I thought I couldn't live without her... but then three years go by, and you forget. Humans will set themselves not to think about things that bring them pain... and chess was like that, an impossible, painful love." Jorge notices many differences in the chess world since his comeback. He doesn't recognize most of the players anymore, there are many GMs rated over 2600 that he's never heard of, and openings that were unpopular sidelines when he stopped playing (such as the Sveshnikov and Berlin Ruy Lopez) have been revived. Jorge is adapting to the changes, and making adjustments in his own play and approach. "I used to play for mate, and now I wait for them to try and kill me." The former one and three minute champion has also found a new favorite time control. "I'm not as fast as I used to be", admits Jorge Sammour-Hasbun "Now I play five minute chess."